At Tate Britain until 25th October this excellent exhibition of Dame Barbara Hepworth’s smaller sculptures is definitely worth a visit. It has been described by various critics as ‘ravishing’, ‘exhilarating’ and ‘exemplary’ and it is, in my humble view, worthy of all those descriptions. Its six large rooms were sparsely populated when I visited late yesterday afternoon, giving me ample time and space to look properly at the wonderful pieces. The first room is given over to carvings, some of her own, in wood and stone and some of her husband, John Skeaping, to whom she came runner-up for the Prix de Rome in 1924. Eric Gill also features. The pieces are small and perfectly formed – a dove, a feline, a figure seated. The second room features works by Hepworth and Ben Nicholson, when they lived together in Hampstead and shows just how much cross-fertilization there was. 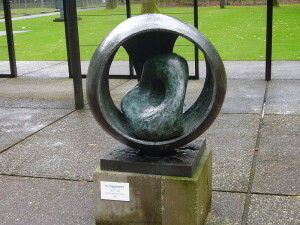 Hepworth begins to use colour on her sculptures and her profile appears in numerous Nicholson works. 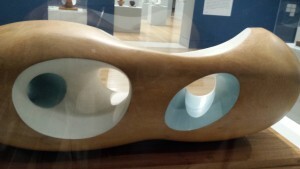 Room 3 show cases Hepworth’s classic modernist pieces, forms mainly in marble or other stone. In 1937, she, with Nicholson ( whom she married in 1938 ), Naum Gabo and Leslie Martin produced Circle; International Survey of Constructive Art, what was intended to be the first in a series of books, though, in fact, no more were published. Contributors include Henry Moore, Brancusi, Le Corbusier, Piet Mondrian, Herbert Read and other famous names. In effect, Circle brought continental modernist artists to the attention of the British art-loving public. Hepworth was one of the few women among them. In the fourth room are some of my favourite small, wooden sculptures, using whites, greys and blues within the concave forms. The fifth room includes a film made of her working on large outdoor sculptures in Trewyn Studio and gardens, which subsequently became the Barbara Hepworth Museum and Sculpture Garden, now part of Tate St Ives. Given that I was pressed for time at this point ( having spent too long gazing and scrutinising ) I did not stop to watch it. Instead I went on to the other half of the room, which contains the wonderful sculptures in quarea wood, all named for places in Greece which she visited in 1954 with a friend, in an attempt to militate her grief after her son’s untimely death. These I love. The red-brown outer surfaces are smooth, warm and beautiful, the inner painted and, in one instance, strung across with copper wires. The light on the planes of the inner spaces changes as you walk around the piece, revealing different shapes and patterns. They are remarkable. I wanted to touch them. The final, large room contains a replica of parts of the Rietfeld pavilion in the Netherlands, for which Hepworth sculpted a number of large pieces in bronze, some of which are here. These are the public sculptures which we are more familiar with. Like the one on the side of the John Lewis department store building in Oxford Street. The exhibition costs £18 for adults, £16.00 concessions ( or £1.50 less, without donation ). It closes on October 25th. Tate Britain is open from 10.00 a.m. until 18.00 p.m. daily, the nearest Tube station is Pimlico on the Victoria Line and the 88 bus from the centre of town ( Regents St., Cockspur St. off Trafalgar Square ) runs passed the back of the Gallery. 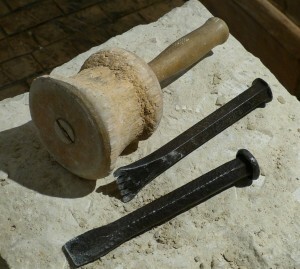 This entry was posted in Art, Culture Vulture, London and tagged Worth a visit by juliej. Bookmark the permalink.